As UNCG celebrates its 125th anniversary, here in the Psychology department were celebrating a more youthful milestone—our Psi Chi chapter has turned 60! Psi Chi, the international honor society for psychology, has over 1100 chapters in the USA and around the world. Our chapter at UNCG was founded in 1958, by four students and Professor Kendon Smith, who was the faculty adviser. Anyhow, a search of the UNCG archives finds a few notes and notices from the early days. In April, 1960, The Carolinian ran a notice about our March, 1960 induction ceremony. We inducted 2 members—Lois Bradley and Jeannette Walker—back in 1960, and these members joined 5 others. Four of them—Linda Daniels, Diane Evans, Ann Hardy, and Beverly Klaff—were our founding student members. From such small beginnings, our chapter has grown to be fairly huge. We induct around 35 students per year into Psi Chi, and we have inducted roughly 1900 students since 1958. The student handbook from 1960 has the earliest description of our chapter that I can find. 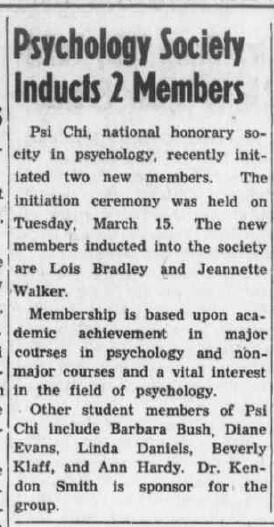 So after 60 years, our chapter is getting old—older than around 90% of all Psi Chi chapters, in fact. But with age comes wisdom, something we hope to instill in each new year’s new group of Psi Chi members.